Accentuate the Positive – Builder confidence is high even with mixed housing news. What to Watch: Gross Domestic Product – Were the latest numbers on economic growth a cause for concern or a step in the right direction? Cyber Security – October is National Cyber Security Awareness Month. Here’s what you should know. Q&A: Pumpkin Preserver – Make carved pumpkins last longer with this simple trick. 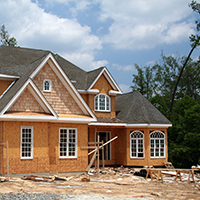 Builder Confidence in September jumped to its highest level since October 2015, as reported in the National Association of Home Builders (NAHB) Housing Market Index. The NAHB gauges builder perceptions of current single-family home sales and sales expectations for the next six months. The survey also asks builders to rate traffic of prospective buyers. All three components moved higher in September. And according to NAHB chief economist Robert Dietz, limited inventory of new and existing homes for sale, solid job creation, and low interest rates are fueling demand for new construction. Sales of existing homes didn’t meet expectations in August, but on the bright side, they did experience year-over-year gains. Sales of existing homes fell 0.9 percent from July to August, according to the National Association of REALTORS®. Yet Existing Home for sale were up 0.8 percent from August 2015. Likewise, the Commerce Department said that August New Home Sales declined from July but were a whopping 20.6 percent higher than August 2015. On the home construction front, the Commerce Department reported that August Housing Starts fell 5.8 percent from July to an annual rate of 1.142 million units, which was below expectations. The South saw a decline of 15 percent, offsetting gains in the Northeast, Midwest and West. Starts on single-family homes fell 6 percent; starts on multifamily dwellings decreased by 5.4 percent. There was some good news: Housing Starts were up 0.9 percent from August of last year. Meanwhile, Building Permits, a sign of future construction, were just below expectations at 1.14 million. While tight inventory remains a challenge in many areas of the country, home loan rates continue to hover in historically low territory. This can help offset home price increases due to limited supply, and provides opportunities for people looking to purchase or refinance. Gross Domestic Product (GDP) is sitting well below the Fed’s target, revealing below average economic growth. What’s happened recently? The final reading on second quarter GDP was revised upward to 1.4 percent from 1.1 percent. While this was a disappointment, the figure is higher than the 0.8 percent and 0.9 percent readings from the first quarter of 2016 and the last quarter of 2015, respectively. What’s the bottom line? GDP has averaged just 2 percent since the recession ended in mid-2009 and reached 2.6 percent in the second quarter of 2015. Overall, though, more recent readings have been a concern to economists and the Fed. GDP of between 2.5 and 3 percent is typically viewed as healthy economic growth. It will be important to see if this number can continue to trend higher, and reach this optimal target range. Online banking, shopping, bill pay and other activities are commonplace nowadays. While many people appreciate the ease and convenience, precautionary measures must be taken to ensure personal data is secure. Lock your computer and smartphone the same way you’d lock the doors of your home or car when you leave it alone. Set up a password and lock your operating system before you walk away to prevent someone from tapping into your information. Update software as soon as you receive notification that updates are available. One of the most important functions software developers perform is keeping ahead of possible security breaches. You should react as quickly as they do to stay protected. Don’t avoid strong passwords just because you think you can’t remember them. There are lots of ways to create virtually unbreakable passwords you can recall easily. Use anti-virus programs to protect against downloading a virus from an infected email or website. Talk to kids about potential online safety hazards and the risks of malicious programs, identity theft and online communication with unknown parties. Letting them surf away without preparation can place them in danger. QUESTION: How can I make my family’s carved pumpkins last longer? ANSWER: It’s easy to extend the life of your pumpkin masterpiece! After rinsing and removing the pulp, wash pumpkins thoroughly with peppermint dish soap (which acts as an anti-fungal agent) and let dry. Once the faces have been carved, soak each pumpkin for one hour in a bucket containing a solution of 3 teaspoons of bleach to 3 gallons of water, which will help prevent microorganisms from consuming the pumpkin. Dry pumpkins upside down for three hours.